Browsing articles tagged with " data modeling"
214-748-3647, Hello…Is it Me You’re Looking For? A developer, Justin Reese, just shared his own story about using the wrong datatype for phone numbers, over at DailyWTF. He did this in an XML document, but I see the same mistake being made over and over again in data models and database designs. In fact, this is a key part of my Data Modeling / Database Design Blunders presentation. My client reported that was a strange bug on a certain page in an app I built for them. Where the contact information for a series of offices was being displayed, all the information was correct except for one piece: the phone number. For multiple locations, the phone number displayed was the same: 214-748-3647. I love reading about his quest to track this problem down and what the issue turned out to be. I also love that he wrote a DailyWTF about himself. We all should be doing that: sharing our mistakes so that others can learn from them. I call that "Free Advice That’s Paid For" in my blog posts. If business users call it a number, it ain’t a number. Customer Number. Account Number. Vehicle Identification Number. Social Insurance Number. Social Security Number (yeah, it’s all numbers now, but nothing would stop the powers that be from changing that). This is especially true for numbers that are managed by people outside your organization. You just don’t know when they might decide to add letter or special characters. I get feedback from at least one person at each presentation that my blunders are way too obvious or that they aren’t serious mistakes. As much as I see poor or inaccurate datatype selection, I have to politely disagree. These are the number one mistakes I see. They compromise data quality, lead to tragic data errors, even. Storing numbers that in fact aren’t numbers as INTEGERS or other numeric datatypes is error prone, leads to nasty slow queries due to all the casting and table scans that may happen. Eventually, those incorrect data values are going to come looking for you. Usually after work hours, in production. If you’ve never seen them in the wild, then either you don’t get out enough of you’ve been blessed by working with highly competent data modelers and database designers. And we all know how rare those are. 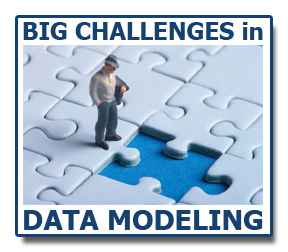 I’ll be part of a rockstar panel of data modeling experts this Thursday, 24 May for Dataversity.net. Graeme Simsion will be moderating us (it’s worse that herding cats stoned on catnip) as we talk about our biggest challenges in the data modeling world. You need to register before joining, but it’s free. You can join the pre-show chat about 15 minutes before show time; I encourage all of you to join early and get your heckling and questions warmed up for the recording. I’m moderating a panel on BI, Data Governance and Data Modeling using Embarcadero ER/Studio on 16 November 2011, at noon EST. What makes this even more interesting is that audience members, like you, will have a chance to submit questions beforehand and during the event. When you register you’ll be asked to submit your questions. Please do so. We love having questions from YOU! I’m deeming the hashtag for this event to be #DMExperts I will try to take Tweeted questions, too.